A new study that involves implanting a pacemaker in the brain is underway to determine if deep brain stimulation (DBS), the same technology used to successfully treat about 100,000 patients worldwide with movement disorders, can be used to treat Alzheimer’s patients. Columbus, Ohio – During a five-hour surgery last October at The Ohio State University Wexner Medical Center, Kathy Sanford became the first Alzheimer’s patient in the United States to have a pacemaker implanted in her brain. She is the first of up to 10 patients who will be enrolled in an FDA-approved study at Ohio State’s Wexner Medical Center to determine if using a brain pacemaker can improve cognitive and behavioral functioning in patients with Alzheimer’s disease. The study employs the use of deep brain stimulation (DBS), the same technology used to successfully treat about 100,000 patients worldwide with movement disorders such as Parkinson’s disease. In the study, researchers hope to determine whether DBS surgery can improve function governed by the frontal lobe and neural networks involved in cognition and behavior by stimulating certain areas of the brain with a pacemaker. 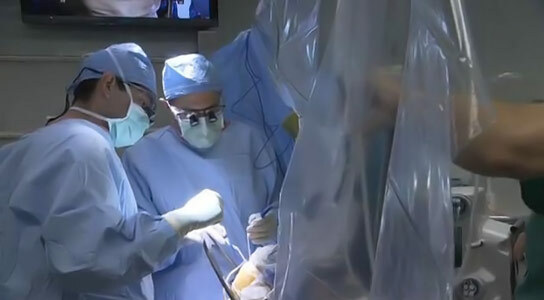 Dr. Douglas Scharre, neurologist and director of the division of cognitive neurology, and Dr. Ali Rezai, neurosurgeon and director of the neuroscience program, both at Wexner Medical Center, are conducting the study. The deep brain stimulation implant is similar to a cardiac pacemaker device with the exception that the pacemaker wires are implanted in the brain rather than the heart. The study, which will enroll people with mild or early-stage Alzheimer’s disease, will help determine if DBS has the potential to improve cognitive, behavioral and functional deficits. Sanford continues to be evaluated to determine the effectiveness of the technology, says Rezai. She says she volunteered for the study to help others avoid the angst she has suffered as Alzheimer’s slowly disrupted her life. Her father, Joe Jester, says he is proud that his daughter is participating in the study, and is pleased to see her showing improvements. Alzheimer’s disease is the most common form of degenerative dementia, afflicting about 5.5 million Americans and costing more than $100 billion per year, ranking it the third costliest disease in terms of health care expenditures in the United States. Alzheimer’s disease – which has no cure and is not easily managed – becomes progressively disabling with loss of memory, cognition, worsening behavioral function, in addition to a gradual loss of independent functioning, says Scharre. The Ohio State neurology team is nationally renowned for expertise in dementia and Alzheimer’s care and research. In addition, the neuromodulation team at Ohio State are pioneers in the use of DBS to treat Parkinson’s disease, as well as exploring the use of DBS for other neurological and neurobehavioral conditions. Researchers at the Neuromodulation Center are completing a study of DBS in patients with traumatic brain injuries, and have initiated a study of DBS for treating obesity. The Alzheimer’s study is scheduled to be completed in 2015. 1 Comment on "First USA Alzheimer’s Patient Implanted with Brain Pacemaker"